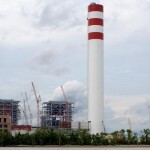 South Korean Power Station installs PennguardTM linings to prepare six concrete chimneys for FGD operation. The main utility of South Korea, Korea Electric Power Corporation (KEPCO), operates 33 coal fired power units with a combined generating capacity of 13.031 MW. 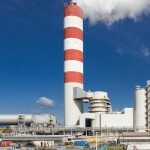 In 1994, KEPCO decided to install flue gas desulphurisation (FGD) plants on all of its coal fired units. At that moment, one of KEPCO’s largest and most modern coal fired stations, near the southern city of Hadong, had two units in operation and two under construction, while two more were being planned. After a detailed study, KEPCO concluded that the change to FGD operation called for a modification of the existing chimneys as well as of those in the construction and design stages. 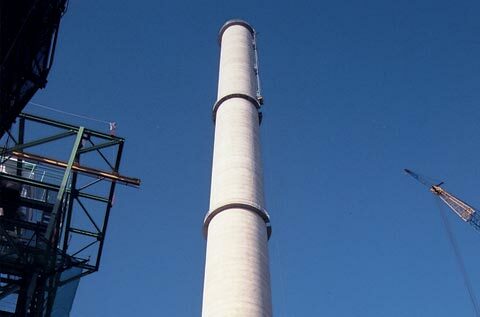 Before the introduction of FGD, the standard chimney design for KEPCO’s coal fired power stations was a 150 m high concrete chimney, protected internally with a sectional ceramic brick liner. The brick liner was placed directly on the inside of the concrete windshield, leaving room only for thermal insulation, but not for a ventilated air space. The addition of FGD plants to the 500 MW units would bring the temperature of the gas stream down to 85 °C. For the chimneys of Hadong Power Station, this would create a technicalrisk; the cool gas stream could easily penetrate through the internal brick liner and acid could condense in the narrow space between the brick liner and the concrete shell. This acid condensate would chemically attack the concrete shell, which could eventually threaten the structural integrity of these chimneys. 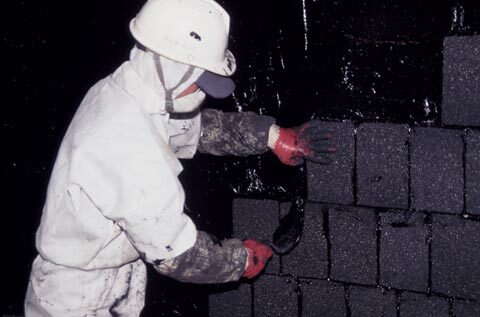 In looking for a solution to the expected problem, KEPCO decided that a lining should be installed on the ceramic brick, or possibly directly on the concrete shells. The lining would have to be acid resistant and impermeable to flue gas and acid condensate. Furthermore, it should be possible to install the lining quickly, without time consuming structural changes to the chimneys. After a detailed investigation, the PennguardTM Block Lining System was selected for the chimneys of Hadong Power Station. Between 1997 and 2000, the six chimneys, with a total internal surface of 27.000 m² have been lined with PennguardTM in a step-by-step process. PennguardTM linings were applied directly to the brick liners of these existing chimneys. Although the chimneys were designed to receive brick liners, these were not installed. Instead, PennguardTM linings were applied directly to the inside of the concrete shells used. These chimneys were designed to receive PennguardTM linings directly on the inside of their concrete shell. The concrete shell does not have any internal supports, as these are not necessary for a lightweight PennguardTM lining. PennguardTM linings are often applied to steel substrates, but more and more frequently, customers choose to install PennguardTM on existing brick flues as well as on existing concrete shells. PennguardTM totally seals the substrate from any contact with flue gas and acid condensate. 2 – A PennguardTM lining is strongly insulating. As a result, it will protect a brick chimney flue or concrete shell from high flue gas temperatures and temperature shocks. 3 – A PennguardTM lining is lightweight (15 kg/m² at a lining thickness of 54 mm). This means, that no structural changes or support anchors are needed for lining installation. 4 – A PennguardTM lining is tolerant of the small imperfections that can always be found in any ceramic brick or concrete surface. If necessary, the installation of a PennguardTM lining in an existing chimney can be done very quickly. In the case of Hadong Power Station, the entire program for lining one chimney (4.500 m²) took an average of 42 days.